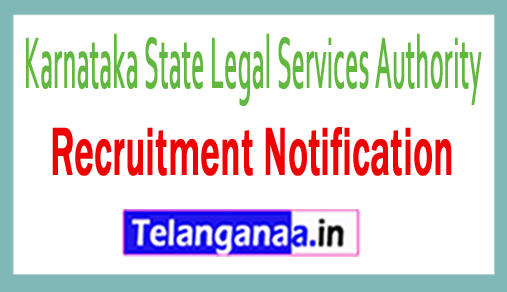 Karnataka State Legal Services Authority has issued a recruitment notice to KSLSA Recruitment to inform Bright and qualified Indian citizens about the 8 vacancies of Project Consultant, Project Coordinator, Project Assistant. Eligible job seekers can apply for the KSLSA Job Posting by sending the application form in offline mode before the end date, which ends on August 31, 2018. Required training: Applicants must have a degree / masters (Management / Social Work / Sociology / Public Administration / Ecology / Political Science) / degree (Law) from a recognized university / institute according to the position. Applicants wishing to apply for the above publication should be no longer than 45 years (Post 1), 40 years (Post 2) and 38 years (Post 3). Monthly Compensation: Candidates who are successfully selected against this recruitment will receive a salary of Rs. 60,000 / - (Publication 1), Rs. 45,000 / - (Post 2), Rs. 25,000 / - (Post 3) from the Recruitment Organization. The Karnataka State Legal Service carries out a written exam and a Viva Voce test to select candidates for the above-mentioned publications. Visit the web portal of the organization http://www.kslsa.kar.nic.in. Once the application form has been completed correctly, the citizens of India, together with the supporting documents and certificates, must send it to the address below before the expiry of the prescribed deadline. Click KSLSA Recruitment Notification here.